Turborilla the developers of the motorcycle racing game Mad Skills Motocross (which also available for GNU/Linux) have released an online economic strategy game named Planet M.U.L.E ! The game is free to play (although not FOSS) and available now on GNU/Linux. With the blessings of the Bunten Family, we are proud to present you the first official internet version since the game was released 26 years ago – and it’s free for anyone to play! Planet M.U.L.E. presents you the classic multiplayer economic strategy game for 4 players. In M.U.L.E. you are colonizing an alien planet called Irata and gathering its resources to make money and be prosperous. Players build factories to produce goods which later can be sold to make a profit. The player which has the largest profit at the end of the game is the winner. 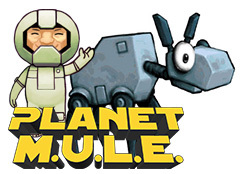 “Some days ago we released Planet M.U.L.E. together with Blue Systems. It’s a remake of an old game from 1983 you may not (but should have!) heard of called M.U.L.E. Some call it the grandfather of all realtime strategy games, while some call it “the best game of all time”. In short it’s a 4 player game about economics where players builds factories to produce goods and sell for high prices to other players. The winner is the player who makes the largest profit. Simple huh? No. If you haven’t read the manual or seen the (soon to come) instruction video you won’t have a chance to understand this game. It’s probably the genre furthest away from Mad Skills Motocross. About a year ago Blue Systems contacted us with the idea of a remake, and since then we’ve been working on it. Now it feels great to finally release it. The development has been a bumpy ride where we’ve tried lots of different play styles and graphics. What we settled on is what you can find here: www.planetmule.com . Just played it a bit, looking extremely beautiful and the gameplay is fun. Can be boring to watch the competitors do their turns, also interesting though.